Using a status field and smart actions, we can create a basic state machine that allows users to change the status of a project and track history. This functionality allows users to think in terms of progression and milestones. When looking at a project, it becomes easier to determine the previous, current and future condition of a project based on the current state and expected actions. Status - Infowise color choice field with values "Draft (DEFAULT), In Progress, Hold, Canceled, Complete"
Workflow Action - SharePoint choice field with values "---SELECT---, Set to Draft, Set to In Progress, Set to Hold, Set to Canceled, Set to Complete"
Last Workflow User - SharePoint people field. Will show read only in UI. Last Workflow Date - SharePoint Date & Time field. Will show read only in UI. 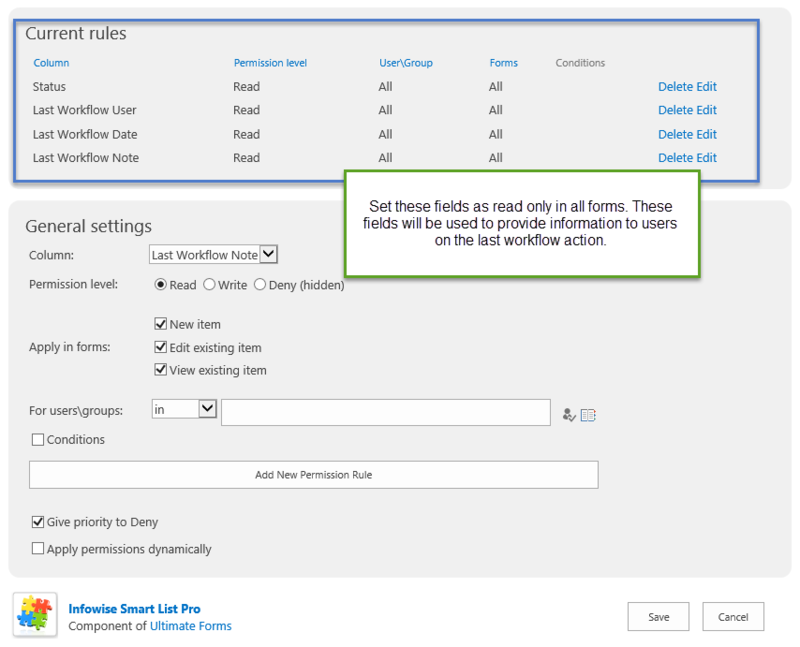 Last Workflow Note - SharePoint multiple lines of text field with 2 lines. Will show read only in UI. Using Infowise advanced column permissions settings, set the Status field as read only in all forms. From the list settings screen, select Infowise tabs and tab permissions. Create a tab called "Workflow". The next step is to create corresponding actions for the Workflow Action field. 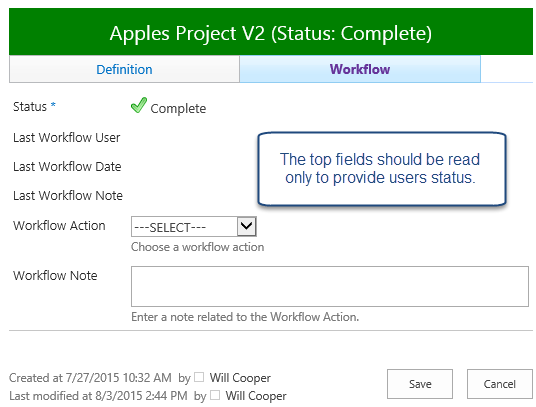 Use update field smart actions to change the status for each respective Workflow Action. 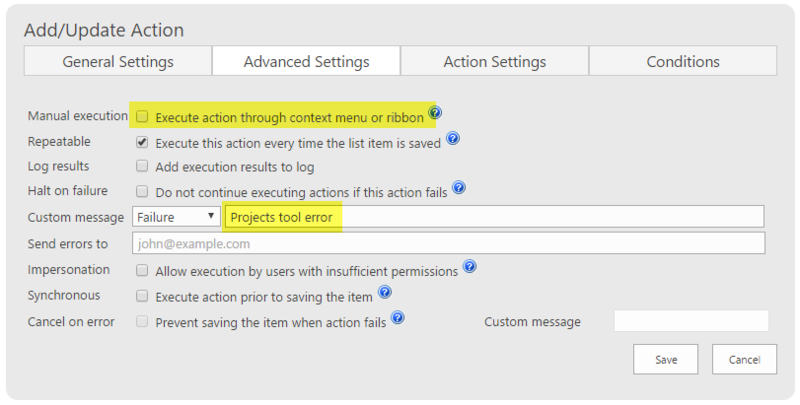 Be sure to reset the Workflow Action field to the default value each time as the last action. Also set up a smart action to clear the workflow message after the other actions so that the field is reset each time. The concept of user facing workflow demonstrates how Infowise can be configured to provide sophisticated user facing functionality. By determining the flow of an actual project and the corresponding statuses for the project, the tool can allow users to track progression and next steps. This logic can be at the heart of the actions used to control the overall flow of a project.